The EAR 312 is a very lively, dynamic solid state preamp! It sounds as good as it looks! Although Tim de Paravicini has been designing transistor-based circuits since the days of the very first commercial transistors, he has never before produced a solid-state amplifier under his own flag. But now, after years of breaking with everyone else's traditions, he has broken with his own and produced the 312 Control Centre, a fully-featured preamp which redefines the world of solid-state just as EAR amplifiers have done for the world of valves. 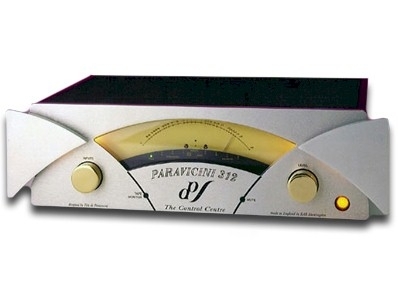 Taking into account the current growth in the number of sources in many hi-fi systems, the 312 offers no less than eight inputs, three of which are balanced and transformer-coupled. What's more, there are six outputs: three each balanced and unbalanced, and because they are also transformer-coupled it is perfectly possible to use both types simultaneously (for instance in multi-amped systems) without upsetting the balanced outputs. This means that six stereo power amplifiers can be driven at once. As you would expect from an EAR product, the phono input also features transformer coupling for moving coil cartridges, ensuring the lowest possible noise, and in order to ensure very high overload headroom and complete stability the RIAA equalization of the phono stage uses an inductor in a unique EAR circuit configuration. The basic amplifying circuit uses just three transistors in a single-ended configuration, a 'valve-like' approach that harnesses the gain of the transistors in such a way as to give sound of unequalled sweetness and clarity. Complete compatibility with other equipment is achieved through the very high input and output headroom of all circuits, plus their low noise. Again drawing on de Paravicini's expertise in the field of transformers and inductors, the power supply uses a choke input filter to give very low noise and ripple, and very low dependency on the purity of the incoming electricity supply: it also generates very low levels of interference on the household supply without requiring any additional suppression components. Simple and intuitive operation has always been a feature of EAR products, and to this end the 312 uses a very high quality and high accuracy volume control with a conventional single-turn range, in conjunction with a unique meter-like scale which clearly indicates circuit gain. Channel balance is maintained to close tolerances right down to whisper-quiet levels. Finally, it should be hardly necessary to mention that like all EAR products the 312 is built to the highest standards and immaculately finished so that it looks as good as it sounds. It will set standards for a long time to come!